The book of Deuteronomy has been immensely influential, not least within the Old Testament itself. It is found among the most frequently occurring manuscripts at Qumran, and it is also one of the Old Testament books most frequently cited in the New Testament. In Matthew's Gospel, it is Deuteronomy which Jesus cites in rejecting temptation. As with so many other Old Testament books, study of Deuteronomy is in the midst of significant change. While for many scholars the Documentary Hypothesis has continued to provide a framework for interpretation, it no longer commands the status of an "assured result." Instead, fresh approaches have been developed, engendering their own debates. Recent as well as older study affirms that Deuteronomy represents a distinctive theological voice within the Pentateuch. While many excellent resources are now available, these tend to be either introductory or highly specialized; there are fewer that bridge the gap between the two. This volume contributes to that need: it assumes some foundational knowledge and guides readers through current issues and approaches. Here is evangelical scholarship that will inform, stimulate and reward diligent teachers and preachers of the Old Testament. The contributors are Paul Barker, Jenny Corcoran, David G. Firth, Greg Goswell, Christian Hofreiter, Philip S. Johnston, James Robson, Csilla Saysell, Heath Thomas, Peter T. Vogt and John H. Walton. 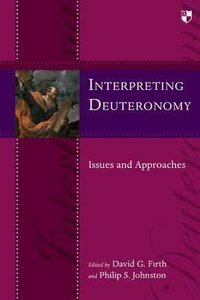 About "Interpreting Deuteronomy: Issues and Approaches"
David G. Firth (Ph.D., University of Pretoria) is Old Testament Tutor at Cliff College. David has experience in pastoral and evangelistic ministry in his native Australia, as well as seven years with the Australian Baptist Missionary Society in Zimbabwe and South Africa. His research interests are in Old Testament ethics and mission, with a particular focus on literary issues associated with narrative and poetry. Philip S. Johnston (Ph.D., Cambridge) is senior tutor at Hughes Hall, Cambridge- for many years Senior tutor in Old Testament and Hebrew at Wycliffe Hall, Oxford. He has also taught at Belfast and St. Andrews. He has published studies of Israelite afterlife beliefs, and he is a review editor for Themelios. Johnston has lived and worked in the divided societies of Belgium and Northern Ireland, and he has an interest in Israel past and present--along with a commitment to reconciliation. His other books include Les Psaumes; Interpreting the Psalms (coeditor with David Firth); Shades of Sheol: Death and Afterlife in the Old Testament and The Land of Promise (coeditor with Peter Walker).